Friends, today I will share the Ali3510c receiver software.If you have a Receiver with an Ali3510c chip, you can upgrade this software.In India there are receivers with Ali3510c chip available such as Lgsat Box and phm 1.All software of Ali 3510c receiver has posted this article. Friends, I am giving all power Vu software of Ali 3510c receiver in this post.Along with I have given the hardware version and Build date details with the software.So if you update the software, please check its HW Version and Build date.With these software of Ali 3510c Receiver, you will be able to run the asiasat 105 East and intelsat 20 sony network on package power vu. Apart from this you will find many features like IPTV, DVB Finder in this software. Friends, a lot of receivers have to use the loader to do the software.Ali3510c receiver loader is given below. By using which you will be able to upgrade software from rs 232 cable in the Ali3510c receiver. you will have to compress the rar file in the abs file, i.e. Extract it. 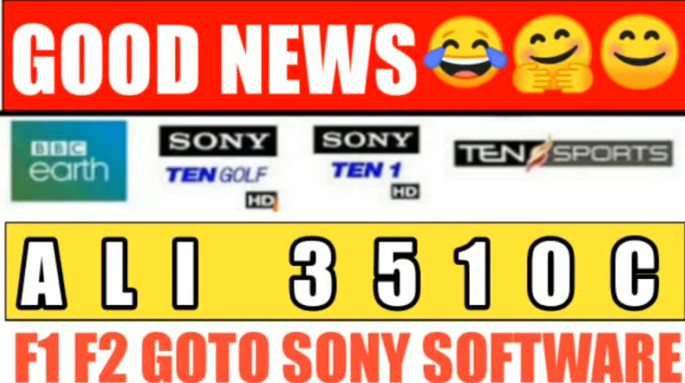 Friends, in this article, Ali3510c satellite receiver has given latest sony network power vu software.I will upload the latest Power vu software of the other set top box very soon.Friends If you like this post, please share it. If you have any questions related to Satellite receiver software, then do the comments to us.Please subscribe to our Facebook page for such interactive information of DTH, subscribe to our YouTube channels Dthtips. Thanks you..
Is it possible to update it with other box software? It has BISS key, but Power Vu key not available. Which software appropriate for my box? Please share link with me.